The Samford Fun Run is held each year to raise money and awareness of a local charity or cause. 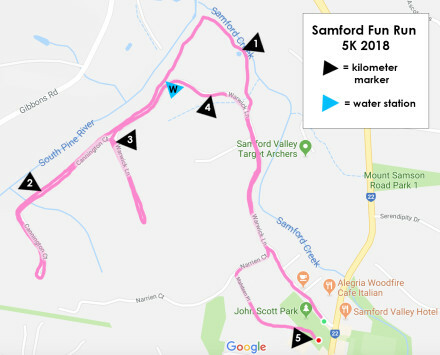 The Samford Fun Run is a fantastic family friendly community event. More than 500 participants enjoyed the walk/run last year. So what makes our run so popular? Mostly it's the friendly, all inclusive atmosphere of the fabulous Samford and surrounds folk, coming together to exercise and support the local community. Add to that the fantastic courses the team have put together and it's an event that will no doubt keep growing. 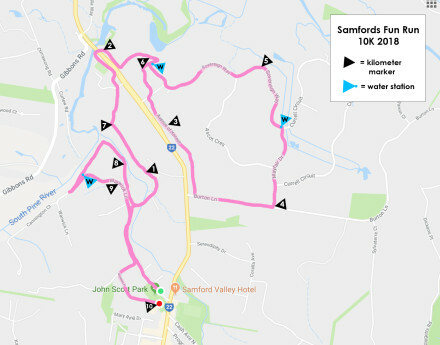 The 10km run-only event is a very scenic and diverse route through the wonderful bushland, the streets of Samford village, and past Millen Farm. The tracks are mostly bitumen, flat gravel and short grass. The course is a good challenge for very experienced runners. If you want to donate without having to buy a ticket, please go to "Make a Donation" the Samford Support Network web site and use the bank reference "SFR Donation"
This year, we are delighted to announce that Snap Fitness of Samford will offer a 2 week membership to everyone who enters the Fun Run (conditions apply)! Details and how to register with Snap Fitness will be provided with your ticket. Please make sure you have a SIGNED waiver for every participant in your party before you attend the fun run. If you do not have a waiver you will not be able to participate in the event. The Waivers are attached to your tickets emailed to your registered address.